This technology is used in processes where it is worked with big air volumes to treat and a relatively low solvent concentration. 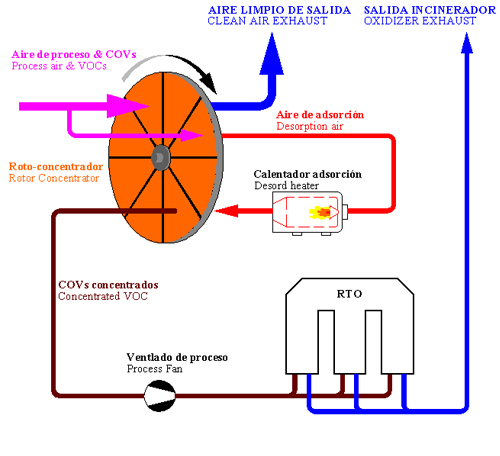 The basic operation principle of this equipment is the COVs emission treatment by means of an adsorption process. The adsorption is produced through a porous material called Zeolite. These equipments should be installed jointly with a thermal oxidation system to oxidize the concentrated air flow that previously has been filtered by a rotor concentrator. The objective is to reduce between 15 and 20 times the air flow of the initial volume that is going to be treated with an enough COVs concentration so that the purification equipment will be an autothermic process. It allows to treat big air volumes. Up to 100.000 Nm3/h for each equipment. Low operative consumption. Low gas and electricity consumption. More economic installation cost than other purification technologies.